Once again PureFormulas comes through. 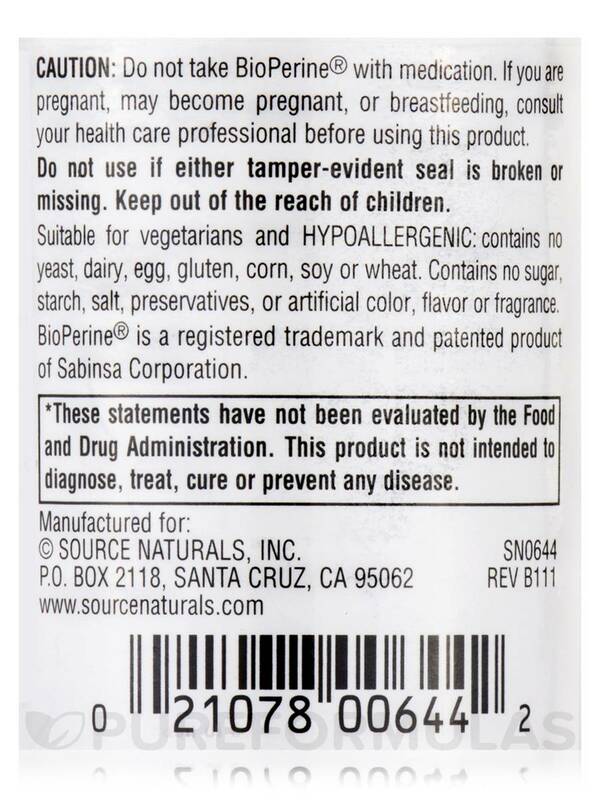 Bioperine by Source Naturals is of great quality! BioPerine 10 mg by Source Naturals is great to increase the potency of my supplements. Small tablets, easy to swallow. Good price. 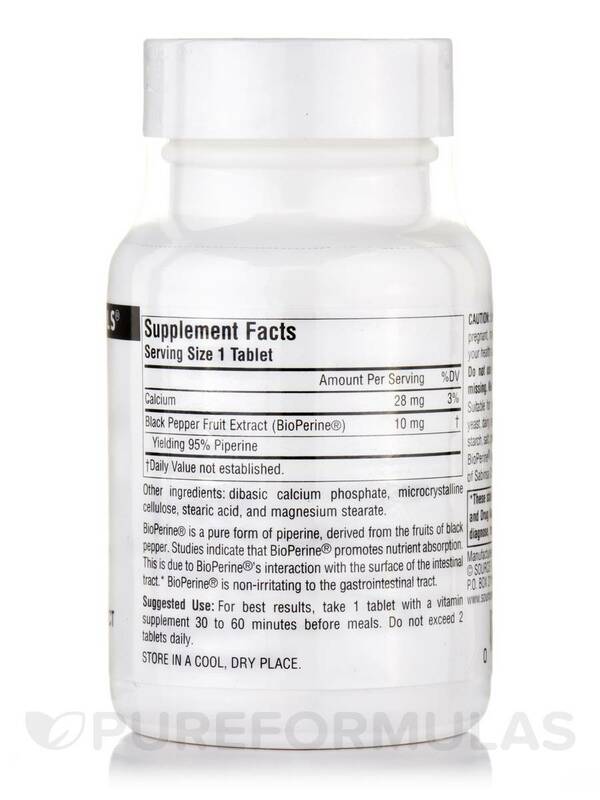 BioPerine® 10 mg 120 Tablets from Source Naturals may promote nutrient absorption. 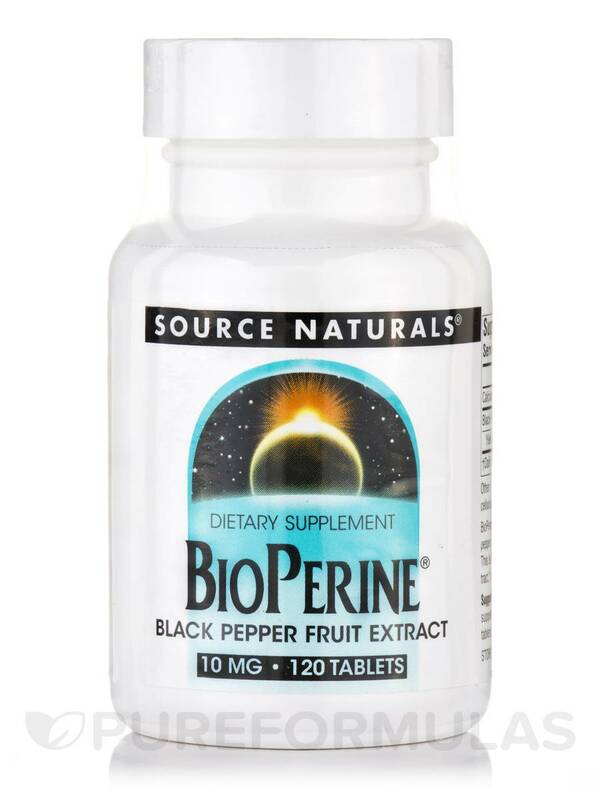 BioPerine® is extracted from piperine‚ the fruits of the black pepper plant. Even though black pepper is commonly used in cooking and for simple home remedies‚ this supplement form of piperine might be very effective for the body. BioPerine® has been the ability to increase the availability of other nutrients for use by our bodies. The black pepper extract interacts with the surface of the gastrointestinal tract and enhances the absorption of nutrients. It mainly works towards the absorption of selenium‚ vitamin B‚ beta-carotene‚ and curcumin. 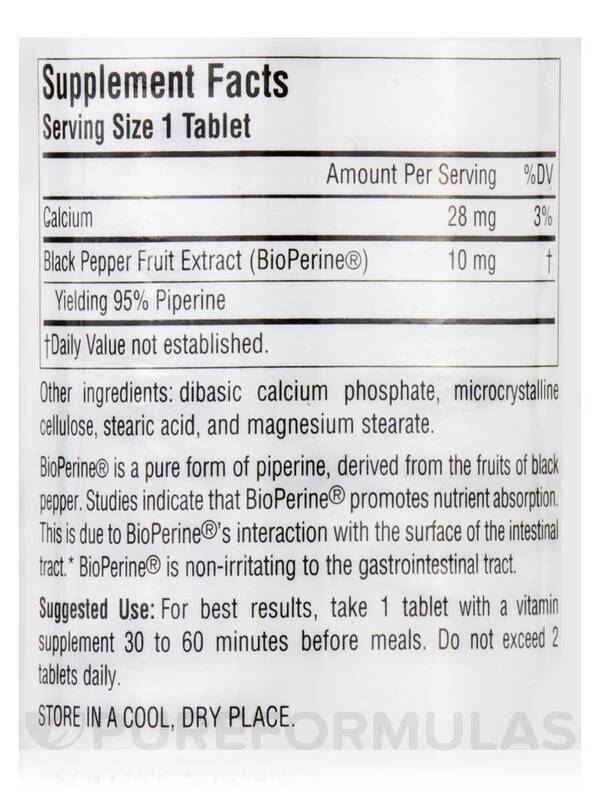 BioPerine® is safe to take and does not irritate the gastrointestinal tract. Studies have also shown that BioPerine® may have antioxidant properties that protect cell damage caused by free radicals. The supplement from Source Naturals may also enhance the body’s natural process of thermogenesis. Thermogeneis is the process by which the body generates energy or heat by increasing its normal metabolic fat-burning rate. The BioPerine® 10 mg 120 Tablets from Source Naturals is suitable for vegetarians and contains no yeast‚ dairy‚ egg‚ gluten‚ corn‚ soy‚ wheat‚ sugar‚ starch‚ salt‚ preservatives‚ artificial color‚ flavor‚ or fragrance. Other Ingredients: Dibasic calcium phosphate‚ microcrystalline cellulose‚ stearic acid‚ and magnesium stearate. Suitable for Vegetarians and Hypoallergenic: Contains no yeast‚ dairy‚ egg‚ gluten‚ corn‚ soy‚ wheat‚ sugar‚ starch‚ salt‚ preservatives‚ or artificial color‚ flavor or fragrance. For best results‚ take 1 tablet with a vitamin supplement 30 to 60 minutes before meals. 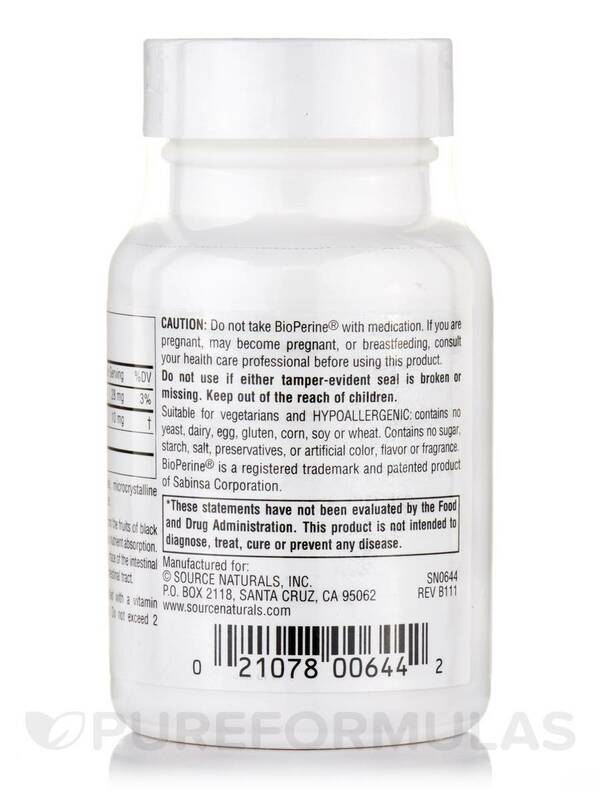 Do not take BioPerine® with medication. Easy to take along with my supplements/vitamins to help increase their effectiveness. Read that turmeric shouldn’t be take without a black pepper derivative such as BioPerine. This BioPerine® 10 mg - 120 Tablets formula really does enhance the absorption of the turmeric and gives me a better opportunity to benefit from taking turmeric. Pretty potent-don’t let it linger in your mouth!!! Good price for BioPerine by Source Naturals. I believe 5mg is effective for taking with other supplements for enhanced absorption, so I use a tablet splitter to cut these in half. To me this is like getting 240 tablets for under $10. Well worth it. I have been taking Bioperine 10 mg by Soure Naturals for about a year in combination with Turmeric. It is of good value. I find supplements are more thouroughly absorbed and utilized ,with Bioperine by Source Naturals, some studies indicate for curcumin 1000's of times. Great price for the benefit. Fast Ship - Quality Product! Bioperine by Source Naturals is a great little product that enhances the body's absorption of supplements. I cannot scientifically attest to how well this has worked for me. But I take a Bioperine tablet each day with my supplements. At the very least, I've experienced no adverse reactions from taking Bioperine. I notice that Bioperine by Source Naturals is strong in increasing the effects of some stims like guarana seed, ecgc, and yohimbine. Also, makes absorption of certain hard to absorb herbal extracts and aminos. ...because I read that Turmeric needs Bioperine to do its job and the Turmeric I had didnt have this as an ingredient. I had been taking Turmeric for awhile for stiff knees and arthritis pain and it just wasnt doing much for me. I had purchased a HUGE bottle of Turmeric though so I decided to add this to my regimen. I do have to say I have noticed an improvement since adding the Bioperine...my joints arent as achy and stiff as before. I will continue to use this product because it does seem to be helping the Turmeric perform better at least for me. Of course individual results will vary.